Size reduction equipment specialist Rapid has added a major extension to test facilities at its headquarters in Bredaryd, Sweden. The expansion is the result of an important strategic investment made by Rapid’s new owner LIFCO very soon after it acquired the company at the beginning of this year. 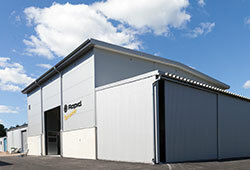 Rapid has added over 500 sq m of space to its existing test area, taking total space to over 1100 sq m; the area now houses granulators of all sizes. Most of the test area now also has a ceiling height of nine meters. “With all this added floor space, together with the extra height for cranes, we can build up and test complete production systems right here in our headquarters,” says Dr. Toni Reftman, CEO of Rapid Granulator AB. The expanded test centre has multiple capabilities: in addition to carrying out acceptance tests with customers and verification tests for new applications, it will also be used for research and development on new innovations. “Our R&D team feels like Christmas has come early for them this year,” says Dr. Reftman. The test centre will also serve as a hands-on education centre for the Rapid sales team, its distribution network and customers, providing a key element in the company’s reinforced focus on product development and customer service. “Customers can come and visit us on site, they can view what we are doing via web cam, or we can record everything and send them the file to look at when and where they want,” says Dr. Reftman.